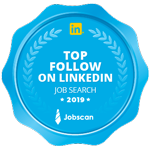 The average search now takes five months, according to a new survey by recruiters Randstad USA of 2,000 people across the U.S. who have recently changed jobs. That’s about the same length of time as before the unemployment rate fell to its current 49-year low of 3.7%. Five months can feel like an eternity when you are unemployed. Focus on what you can control. Not on what you can’t control. ◆ Before you launch a search, consider creating a written job search strategy, including the level of networking activity that you will commit to. Hold yourself accountable to weekly metrics. ◆ Make sure that you have quality of job search materials, including the resume and cover letters. ◆ Mock interviews are a small investment that can offer you interview confidence, stronger more targeted responses and a leg up on your competition. What are other things job seekers can CONTROL in the process?